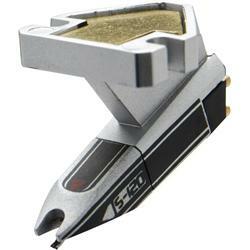 Ortofon OM S-120 Serato Cartridge Kit - OM Serato S120 DJParts - All Variety of Parts that DJ Needs. Ortofon introduce the new “Ortofon|Serato S-120 DJ Cartridge” with a patent pending design that will virtually “hug the grooves” of a record using a unique suspension system that the two companies have co-designed. All vinyl DJs will benefit from the extreme tracking ability delivered by a revolutionary new cantilever suspension. With 4.0 gms of vertical tracking force, the S-120 achieves an amazing tracking ability of 120 μm compared to the conventional 80 μm at 315Hz. That is a 50% performance improvement on standard DJ cartridge. * Ortofon|Serato S-120 OM, which is provided with matching custom head-shell with graphics that allow for easy mounting. The OM S-120 Kit mounts directly onto any standard DJ headshell (not included) and includes a replacement stylus.